What does it mean when someone talks about WordPress Hosting? 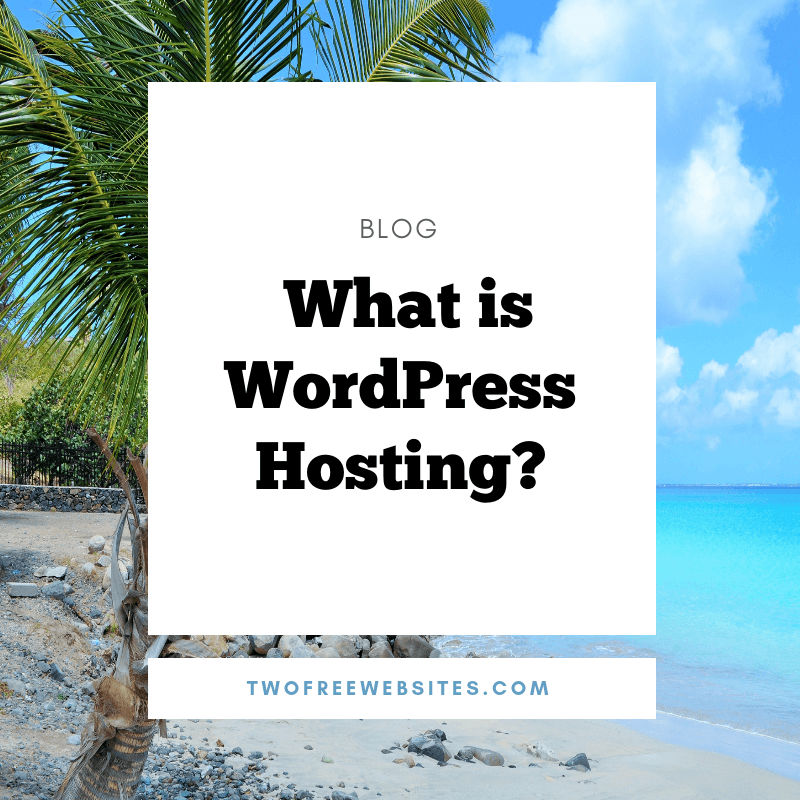 What is WordPress Hosting? Well, Hosting itself is a special service that provides technologies and servers to allow your website to be viewed on the Internet. WordPress Hosting is a service that does that specifically for WordPress. So, WordPress Hosting provides technology and services specifically for a WordPress website to be viewed on the Internet. Got it? WordPress has become one of the most popular website tools. WordPress is wonderful because you need little to no programming knowledge to build a website. WordPress allows you to pick from thousands of beautiful themes for your website. After that, you can easily customize your Website from the WordPress Admin Panel. That is an easy to use interface. Again, no programming required. One benefit of WordPress Hosting is that it is specifically geared for WordPress. As a result, you can benefit from many types of special functionality such as plug-ins. You can literally choose from thousands of different plug-ins. Plug-ins are pre-programmed functionality that you can use to enhance the functionality of your website. One of my favorite plug-ins is Smush which optimizes your graphic and images on your website. I have noticed drastically improved loading times just from this one little plug-in. One of my other favorite plug-ins is All-In-One SEO. This is the plug-in that I use for SEO on my websites. SEO stands for Search Engine Optimization. SEO is extremely important in Affiliate Marketing. My top pick for WordPress Hosting! WordPress Hosting is just a special type of Hosting that meet all of WordPress’ specific needs. In my opinion, Wealthy Affiliate offers the best WordPress Hosting. All of the above is only $49 per month. I think that is a really amazing deal. I have been a member now since 2016. WA offers onreally great site speed and customer support which is a must for me. I have looked into other Hosting sites as well that I did not like as well as Wealthy Affiliate Hosting. GoDaddy does WordPress Hosting. I was not pleased with the user-friendliness of it nor the customer support. At Wealthy Affiliate, the average page load time is 1.3 seconds per page which is an excellent SiteSpeed Rating. They host on the most powerful servers in the world through Amazon Hosting. They also have a “load limiting” process that will monitor your website automatically and make sure that it always runs at optimum performance. I have not found any other Hosting companies that offer anything close to that. WA also does “double hosting”. Double Hosting means that your websites are Hosted on two servers. If one goes down, there is a mirror image of your website on another one that can be pulled up in an instant. WA also prevents hacking or spam before it happens with double layers of security. They understand the security vulnerabilities of the WordPress platform. It is so important to feel safe with your WordPress Hosting company. Feeling safe and knowing that the WordPress Hosting technology and details are taken care of will allow you to focus on your business. They also do daily Back-ups for you at Wealthy Affiliate with your Managed WordPress Hosting experience. Below is a comparison chart with some of the specifics. This is a comparison of a few Hosting Companies below. Take a look and see what you think. Customer Support – You need someone there 24/7/365 to answer WordPress and Hosting Questions. You will most likely also need some training available to you along the way. This is something to think about. Speed – This means load time and it does affect your site. This means how fast your site and pages load. If your pages load slow, you will lose traffic. 1.3 seconds per page is an excellent load time. Don’t settle for less than this. Ease of Use – How easy is it to create a WordPress Website? Hosting companies now offer click of a button installations. This should be what you are looking for. Easy installation and development leaves much more time for writing content. You want to be able to focus on developing your website and content without worrying about every little nitty gritty technical detail regarding the Hosting. Find a professional Managed WordPress Hosting company and this will not be an issue for you. Security and Back-Ups – It is very important to know that your data is safe and security. If something should go wrong with your website, you need to know that it can be restored quickly. As far as Security goes, make sure that the Managed WordPress Hosting company that you choose is safe from Spam and from Hackers. You cannot be too safe when it comes to your own website. After all, you put a lot of time and effort in it. WA Hosting checks all of these boxes for me. I have been building websites for 10 plus years and this is from my experience. So, what do you think about the information in this post? This information is me sharing my personal and professional experience with you. I have been in Information Technology for over 20 years. Learning is a lifelong endeavor for me and every single day brings a new adventure. You can read more about me on my About Me page on this website. Do you have any good or bad feedback on any Managed WordPress Hosting company that you have tried? Have you tried Wealthy Affiliate? What was your experience?